I have been very fortunate to have traveled to numerous countries and cities over the years, yet I somehow have not fully explored my own city. Why is it we take time to explore other cities but not our own? Is it because its very easy to procrastinate in our own city? “This weekend I will do spring cleaning, maybe next weekend I will explore” or “Looks like its going to rain.. let’s skip it and watch movies at home instead”. Well, no more! The time is now people! I have decided that this summer and fall I will be scheduling days to explore this city and sticking to it. The husband, Baby J and I didn’t have defined plans for Father’s Day, so about three weeks prior I put it in our calendar and decided we would go. The morning of Father’s Day, I checked the forecast for the day and saw that it was going to storm around 3PM. My husband and I both looked at each other, wondering if we should cancel our plans, but I decided “No! We are going! A little rain never hurt anyone”. We left home by 10:45 got downtown, parked the car, took the ferry and were on the island by 11:30. I was shocked, most of the island is a giant park, with a small amusement park for kids, a beach, splash pad, play structure, and numerous areas to have a picnic. We started the day at Centreville (amusement park) which has free admission though you do pay for rides. Baby J loved the Antique carousel, the train ride and was brave enough to go on a few rides by herself! 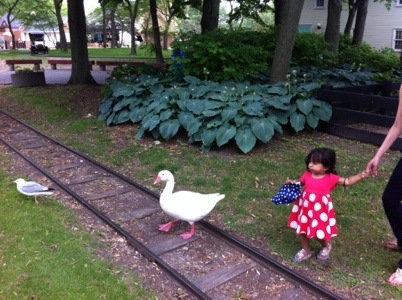 She was also fascinated by the numerous ducks and geese wandering about. For lunch, we decided to put out our blanket and have a picnic by the water’s edge. I was very glad to have packed a lunch as food was quite expensive ($7 for a slice of pizza and some milk). Afterwards as Baby J drank her milk, I lay on the blanket staring at the clouds. It was a true “stop and smell the roses” type of moment where I was able to fully appreciate being in nature, without the distractions of phones, iPad’s etc. At the end of the day, I felt completely recharged, similar to how I feel when I go to the cottage for a weekend. Yet, instead of driving for hours to the cottage, it was a quick half hour ride to the island! In the end, I am so, so glad that I toured a little piece of my city, and can’t wait to explore what more it has to offer. This entry was posted in Family, Travel and tagged Centre Island, Centreville, Father's Day, Toronto, Tourist, travel by shwetasays. Bookmark the permalink.